Southstar Trails, Waitangi Mountian Bike Park - Paihia from In The Frame on Vimeo. The Bay of Islands conjures up romantic images of Pohutukawa clad islands fringed with sandy white beaches, dolphins playing amid kayaks paddling around the bay. The Waitangi Treaty grounds and the newly built museum are the big attractions for kiwis and overseas visitors driving 3hrs north of Auckland. But what if there was also a mountain bike park? For the thousands of riders that congregate in hot spots like Rotorua, Nelson and Queenstown, that would be a real reason to venture north. Thanks to the big dreamers at Focus Paihia – an award winning community organisation - that dream is rapidly turning into reality. 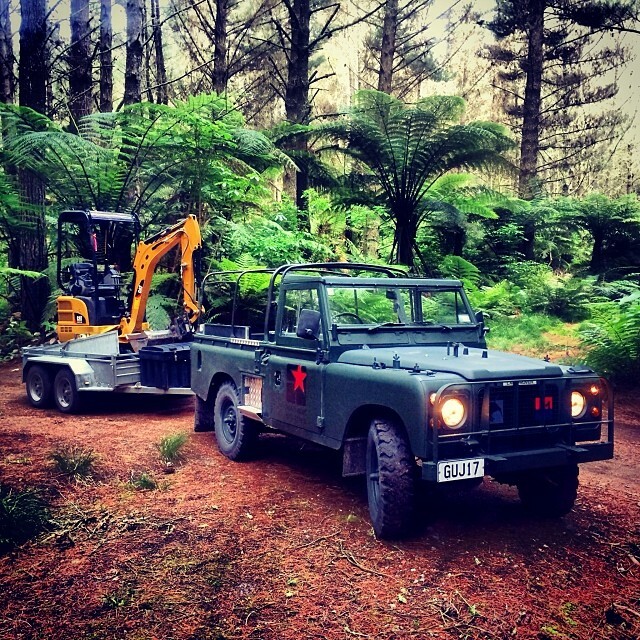 Southstar Trails has had their team of 6 trail builders and 3 excavators building trails in the Waitangi Endowment Forest since mid-October 2015. Already there’s 15km of trail built and there’ll be at least another 5km by the time the park opens for is first visitors later this summer. That’s if the carpark approvals and construction can be completed by then! Focus Paihia have drawn together many parties to make the Waitangi Mountain Bike Park happen. The land in the Waitangi Endowment Forest was gifted to the people of NZ by Lord Bledisloe, and a portion of the money made from the ongoing forestry operation goes to fund the operation of the Watangi Treaty Grounds. The land is managed by the Department of Conservation, who in turn contract a commercial forest manager, there are two local Iwi groups with Treaty claims on the land that provide representatives, as well as a horse riding concessionaire, approving every trail that Southstar designs. It’s even more amazing that this incredible feat of coordination is performed for Focus Paihia by local volunteer Tiffany Holland, a mother of 2. Tiff and her physio husband Robin are keen mountain bikers, regularly travelling with bikes and kids all around NZ to ride – they can’t wait to have these trails available on their doorstep. The initial trail design and development has focused on the family friendly grades with most of the trails built grade 2 (easy) and 3 (intermediate), and one grade 4 (advanced). The downhill trails milk the most out of the 100m of vertical elevation available providing a lot of fun for a small amount of climbing. The aim is to have one hill climb and six top to bottom downhill trails finished by late March 2016, all in Zone 2. Plus there is also a cross country loop aimed at families. All up there are 5 zones to be developed so there’s plenty more trail development planned in the years to come. The longest trail is the 2.1km Arepa Loop. Arepa is Te Reo Maori for the greek letter “alpha”, the first letter of the greek alphabet, the first of many. This trail is designed as a skills progression from the neighbouring wide bermy Challenge trails. The Arepa Loop is digger built, but it’s only 0.9-1m wide, and it incorporates lots of log and stump features. These match the skill progression development requiring precision steering, central balance and timing. Next up is the Junior DH – a feature laden mini version of the famed Taniwha Downhill deeper in the forest. There’s some off cambers, log drops, jumps and an optional log ride. The club hopes that this trail can host events aimed at intermediate and high school students in the future. The Te Rauhitangi trail is a short trailbike focussed downhill along the edge of the block. For this track a combined contractor and volunteer construction method was used, with the chainsaw and digger going through and clearing the forest slash with minimal ground work and then volunteers following behind creating trail features. This is a popular trail to exit the forest on, linking into the partially completed Dodzy Skills Park. Construction is ongoing in the Skills Park so keep an eye out for machinery, and if the entrance is taped closed then please don’t go in there. The Old Exit trail was a technical favourite among locals and it’s new incarnation of the same name is also destined to be a favourite. The entrance has moved 100m up Tokorangi Pa road and starts with a little climb to the top of the block and then a rollicking drop and berm filled ride to link into the un-logged section of stair drops and roots. Southstar Trails // Genesis and Exit trails re-born from In The Frame on Vimeo. A weekend away with my trail crew, hitting trails and sipping ales – sounds like a great idea! Friday we packed up and hit the road, arriving in Napier just in time to share a sunset shred on the recently opened concrete pump track with locals Glenn Richards, Dingo Dave and Jared Perkins. It was cool to see the facility so busy and not just with bike riders, the brushed concrete surface opens it up to skateboarders and scooter riders to mix it up too. This is a Napier City Council project that I did the CAD design work on, then the construction was done by CPM Construction. The inspiration came from the work that Claudio Calouri and his company Velo-Solutions have been doing in Switzerland – world-leading concrete and asphalt hotmix surface pump tracks and pump parks. The roller and berm dimensions came from Southstar Trails experience, taking the best sections from the dirt surface pump tracks we’ve built. I’d done site inspection visits in Jan/Feb 2015 to check on progress. Unfortunately the base material under the concrete is river gravel, without a lot of clay content to bind it together. I had been able to check all the rollers rode well, but CPM weren’t able to pre-form the berms to a rideable state before the concreting was to be done. I couldn’t check how 2/3rds of the track rode before it was set in concrete - ahhhhh. Any designer will tell you it’s tough to envision something on a computer screen and have it come out perfect in real life, especially something that’s never been built before! So I was super nervous rolling up to the site on Marine Parade. But it worked out, the outside berms are awesome, the concrete surface makes them super-fast. Some of the inner berms transitions are a little steep, but they still ride ok on a bike, maybe a little tough on the skateboard. Southstar Napier pumptrack from In The Frame on Vimeo. Makara Peak is a pretty cool place for a number of reasons; number one it’s where the legend pioneers of New Zealand Mountain Biking, the Kennet Bros really made their mark as trail builders. If you read the Kennett guidebooks and get to know these guys you’ll soon realise they love big day long adventure missions with bigger doses of hill climbing. Makara Peak’s existing trails bring that raw back-country ethos into the city, the trails are typically narrow and tight, there’s lots of handle bar catchers and the riding requires accuracy and rapid full body tweakage to maintain momentum. The 300m vertical climb up Makara is so well made, that the problem arose that beginner riders could access the Peak but struggled with the grade 3-4 Northface Trail – the easiest descent. So the Makara Peak Supporters and Wellington City Council recognised that they needed a new easy grade descent from the Peak of the park. A wider flow type trail would provide a great yin to the yang of the existing trails. It would provide a facility to develop the bike-park type riding skills of pumping rollers, manualling, riding bermed corners and working up to doing jumps. The second reason Makara is a cool place is that it’s had a huge amount of native tree planting, and pest control. The forest is slowly regenerating and there’s plenty of bird life. It’s a wonderful thing! Southstar Trails was contracted for the trail design and construction work. The track took a week of trail marking, in the late December sun. It was tough going through dense scrub of double head height barberry and gorse that had to be chainsawed and then pulled out just to be able to walk through. Bryn Dickerson and I did tank-about on the chainsaw, definitely one of the toughest trail designs we’ve done. Following design the construction team moved into action, with two diggers operating and a third person chainsawing, raking, shaping and compacting. There was only a very thin layer of topsoil over the top of rock, so the first machine was equipped with a rock breaker, while the second followed behind shaping the rock into track features. Compared to constructing trails in the volcanic soils of the central north island, construction speed was only a quarter, but it also means the track is super solid! Emil de Vries, Rohan Alton, Bryn Dickerson and Lloyd Jenks were the Southstar Trails trailcrew for this project and they got creative adding lots of features, many of which come to light as your speed and skill increases, like roller doubles that become triples and wallrides that open up as momentum increases. Southstar trails presents: Peak flow // Makara Peak, Positively Wellington from In The Frame on Vimeo. Miramar trail project opening from In The Frame on Vimeo. This 3.5km grade 3 trail that descends from the Southstar Shuttles drop off on Hill Road down to the black house car park on Tarawera Road. 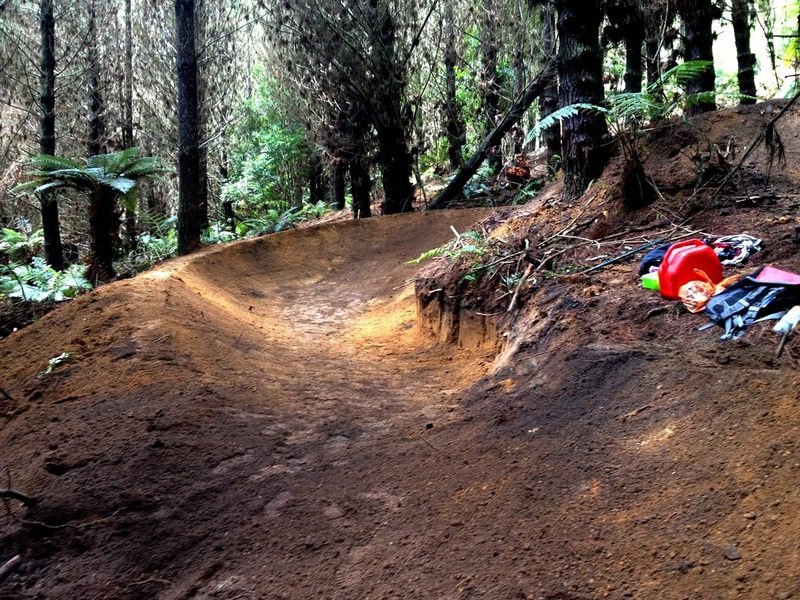 The trail is open, and is fast becoming a Rotorua classic. Eagle vs Shark is a cult classic NZ movie, released in 2007 featuring actors Loren Taylor and comedian Jemaine Clement. This movie is not that movie. If you haven’t seen it, well you probably should rent it on iTunes tonight, with your partner…or your Mum. Eagle vs Shark from In The Frame on Vimeo. 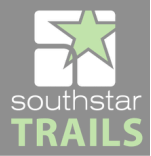 As a part of the trail development of the “Mill Block” forest, the Hawkes Bay Mountain Bike Club contracted Southstar Trails to design and construct both of these landmark trails. MTB Access to the Panpac forest requires a 3 week permit or annual membership, available from the club website here. The annual memberships run from 1st July to 30th June, so now is a good time to get one and sample these sweet new trails. While this clip was being filmed on sunny Sunday afternoon, it was inspiring to see the steady stream of riders coming past, a few were even lapping it out, climbing back up the road and hitting Grand Traverse again and again. One of the cool trail features on Grand Traverse is the technical rock sections. While Casey was constructing the trail with the digger he saved as many of the big rocks as he could and then Emil used them to create trail features – shaping rock rollers, bump jumps and armoured transitions. This has added a technical skills dimension to an otherwise dirt based trail. The fourth rider in the video wearing the orange helmet is local Glenn Richards, the Hawkes Bay based instructor for MTB Skills Clinics “We’ve definitely seen an increase in people booking clinics, riders want to develop their balance and technical skills to get the most out of these two new trails “. Funding for these HBMTC trail developments has been provided via grants from the New Zealand Community Trust and the Southern Trust. It’s awesome that these trusts are consistently backing MTB clubs around NZ to develop their trail networks. This funding is enabling a new generation of riders to get outdoors and enjoy the thrill of mountain biking. Combining the new trails Mint and Grand Traverse with existing classics like Mr Whippy, Tinker and Stingray makes for a compelling reason to visit the Hawkes Bay, when are you going? Grandtraverse from In The Frame on Vimeo. Southstar Trails completed the construction of a new trail called “Mint” for the Hawkes Bay Mountain Bike Club. The concept and name for this trail was conceived by Brena Smith, a Napier based rider, after 6 months of part time hard effort with a grubber and spade, the first 250m of trail was completed, Brenda’s joints were starting to feel the pain and so Brenda decided to retire from this trail construction caper and spend more time riding her bike. The HBMTBC work closely with Pan Pac, managers of the Eskdale forest and with upcoming logging operations due to knock over some of the established trail network, the club is focussing on expanding the trail network in the neighbouring Mill Block. This is the area to the north of the Pan Pac Mill on SH2, just north of Napier. Ross Mepham, HBMTBC’s Trail Development Manager outlined the vision for the new trails “We really wanted to take the next step up with these new trails to make them not just an attraction for our 2000 members in the Hawkes Bay, but to make these trails a national attraction. Mountain Bikers are travelling around NZ every weekend to ride in places like Rotorua and Queenstown. Napier has the terrain to become a national level destination too.” The completion of Mint is the first of these new crop of trails with many more in the planning and fundraising stages. Brena’s idea of a fun swoopy rolling trail together with some generous funding from Napier’s Hawkes Bay Telecom Business Hub allowed the HBMTBC to engage the services of Southstar Trails. Based in Rotorua, Southstar’s trail builders have been responsible for many iconic trails around New Zealand and in Bike Parks around the world. As you can see in the video, the new trail is a bucket load of fun to ride for intermediate level mountain bikers. So if you’re looking for something fun to do this weekend, visit the sunny Hawkes Bay and check it out! MINT! Mint from In The Frame on Vimeo. Southstar Trails were contracted by the Hawkes Bay MTB Club to build a new downhill track. Club volunteers had cleared the line and so we set to work imagining and building features - doubles, step downs, step ups etc and mixing in a solid dose of natural trail roots, off cambers, chutes etc. The result is a 2min50sec track of technical downhill racing. Super Plus is an existing trail that starts from the saddle in the road between Wainuiomata and Petone (Wellington). The Trail had been built by a local landscaper for the Wainuiomata MTB Club, it had a perfect gradient, but was narrow and lacked trail features. So Southstar Trails were booked in to put the CAT digger into action. Casey King was at the digger controls and Matt Walker chief jump shaper on the quad and plate compactor. As you can see from the video gram above the result is a really fun and playful trail, tabletop jumps and super fast berms. 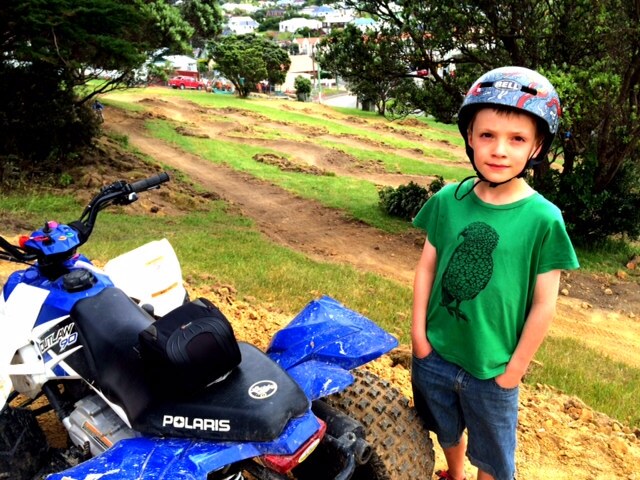 The Island Bay Kids Pump Track is the brain child of local residents keen to see their kids active on their bikes, it was financially supported by the Wellington MTB Club and Wellington City Council. Given a blank canvas of a hill side in the local park, I (Jeff Carter) designed a track that will let riders develop skills in sequence. The bottom loop has gentle rollers that get riders pumping to maintain speed in a rhythm, eventually learning to gather momentum. The rollers are regularly spaced. Once this has been mastered, the top loop has larger rollers, small tabletops and sets of double rollers that can be jumped or manualed. This has been one of our most rewarding projects as local kids would swarm onto the park after school with massive grins. The Corners Track project is funded by a partnership between Southstar Shuttles and the Rotorua MTB Club. The brief to the Southstar Trails crew was to create a new trail that linked into and matched the character of the much loved Corners Track in Rotorua. Corners track is known for it's sequences of bermed (banked) corners that swoop through the trees. So we took this character and amplified it in the new trail, making the berms twice as big, and twice the fun to rail around. This is also the first time we tried out the idea of "Golden Ratio" berms - these are berms that have an expanding radius rather than a constant radius, enabling riders to naturally accelerate through the corner - try them and let us know what you think! In November 2013 Southstar Trails received delivery of our new CAT digger. After a thorough review of the excavators available on the New Zealand market the CAT was selected as it has 20% more power compared with other machines in it's weight class - this means we can work faster, dig more dirt and make more awesome! One of the special features of this digger is a 180 deg tilt bucket. This means we can swivel the bucket around to any angle, making the construction of berms and the battering of banks fast and if we need to we can go right up to vertical on the berms!